Someone recently asked me how we’ve built such a great culture at Unbounce. I thought about it for a minute and responded that we didn’t do anything really, all we’ve done is hire good people and stay out of their way. We’ve never really sat down and asked “how do we make a great culture?” You can’t create culture, but great culture “may” develop as a result of a handful deliberate actions. Let me elaborate. I’m a bit of a hobby gardener and I’m starting to get pretty good at it. However, I can’t grow great tomatoes. What I *can* do is create the conditions that improves the chances that I will have strong healthy tomato plants that produce a plentiful tomato harvest. I start with a good heirloom tomato seed that’s ideal for my area and use a quality seed starter to maximize the healthy sprout. Transplant to a sunny location in a good organic soil and compost. As it grows, stake it to give it good support as it gets taller. Surround it with good companion plants such as basil, parsley, marigold, alliums, garlic, etc. to create a healthy ecosystem. Maintenance is pretty simple, prune the suckers, keep the roots well watered and weed the surrounding area from time to time (though a thick covering of mulch should keep the weeds away and keep moisture in the soil even in the peak of summer). In fact, at this point, don’t fuss over the plants, let them do their thing. With a little luck I’ll have plenty of big tasty tomatoes come August. What I’ve done is provide the right conditions for the possibility of great tomatoes and company culture is pretty much the same thing. You can’t create culture (though you can certainly ruin it pretty fast), all you can do is create the conditions for a good culture to sprout and grow. Just like my tomato plants, it’s the employees that create the culture. Here are a few tips if having a great company culture is important to your business. Don’t just put bums in seats, look for people that are a little special in and outside of work and treat them well. In fact, treat good people like ‘the company’ is lucky to have them or else you will end up with a company full of people that you’re not so lucky to have. I always look for people that will inspire me and that I can learn from, in or out of work. Give those good people clear mandates/goals/objectives and hold them accountable for such. The best people want to run with things and be accountable for their actions, win or lose. Common mistake is to hire really good people then get in their way at every turn. You can’t really hold someone accountable for results if you keep telling them how to do their jobs. Your employees need to know that you trust them 100%. Give them guidelines but show that you have confidence in them and empower them to move forward quickly. Don’t hinder them with unnecessary rules and procedures. You know what they say, easier to ask for forgiveness than ask for permission. If you discover that you’ve hired someone with detrimental attributes to the culture, the talkers, complainers, trouble makers, just plain bozos, then fire them. They are like bad weeds in your garden and if left unchecked, they will multiply beyond your ability to handle it. Nothing worse for your culture (and your business) than a handful of bozos that bring down the moral and momentum of others. To be clear, this is not the same as someone that cannot perform the job you hired them for. If you’ve hired a good person but they just don’t cut it in that role, work with them to shape something that they can do well because good people are hard to find. If you’ve done your part, with a little luck, your employees will take care of creating an awesome culture. 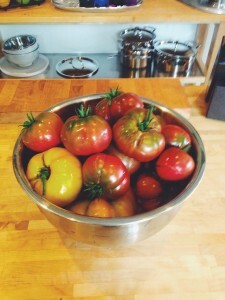 Next time you find yourself asking how to create a great team culture, try growing some tomatoes.